by Eshwar Sundaresan. Pages 328. Rs 350. First used in 1913 as war jargon, the term Bangalored referred to the process of blowing up wire entanglements by a Bangalore torpedo. This explosive-laden tube was invented in the city, hence the name. In more recent times, it refers to people in the US who have been laid off because their jobs have been outsourced to India. Specifically Bangalore, the Indian equivalent of Silicon Valley, as it has been the prime beneficiary of this move. Read on, however, to discover the author’s take on this term. "Do they yawn at bureaucracy, tear their hair out at Indian paradoxes, appreciate Bollywood, make Indian friends, better still fall in love with them, repose faith in the local buses, sleep well, rear children, agree to be taught, stand up to teach, protest against prejudices, correct their perceptions, feel at home, feel homesick, fall ill, get well, get employed, employ others? Do they?" 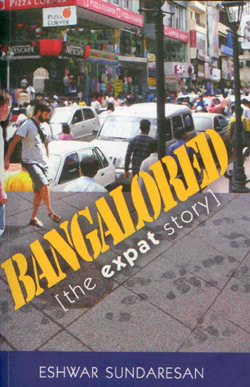 Many such baffling musings drove Eshwar Sundaresan to put together this truly readable work on the expatriate population of Bangalore. Anecdotal in nature, the narrative is based on interviews conducted by the author over many months. His nosiness brought him into contact with a multitude of characters, ranging from students to IT professionals, Taekwondo coaches to sculptors. He chatted up Chinese shoemakers and chased European corporate honchos. He dined off Trinidadian restaurateurs while picking on spiritual therapists. He deliberately ferreted out Bangalore-bashers. Evidently, the author has an easy acceptance (barring the odd defensive non-starter) of the diversity of views—not always flattering—expressed by the protagonists about a city he calls home. He neatly addresses issues of social relevance through their observations. Some of these as disheartening as incidents of reverse racism. But don’t lose heart. Take the book to its end to discover some selfless individuals who work tirelessly with our poor—some mere businessmen, some visionaries, some reluctant spouses and some accidental tourists. A few refugees from strife-ridden states from around the world and a few Indophiles. Whatever their reasons for coming to Bangalore, the one common thread that binds them is that the mere thought of moving to another Indian city is unimaginable. The first half of the book, although presented as a collection of short stories, unravels like a novel. This is so, as the author has interwoven the lives of some of his real-life characters to read as one story. While most of the chapters make for an interesting read, my personal favourite is Winning Hearts. The chief protagonist in this tale is an Indian, Dr Devi Shetty, paediatric cardiac surgeon and founder of the Narayana Hrudayalaya. It is his professional skills that attract a sizeable chunk of short-term residents on medical grounds. They, too, have an account to relate. In the latter half of the book, a brief history of the city acquaints the reader with expatriate population dating as far back as the mid-18th century when Hyder Ali took to employing Portuguese and French soldiers in his army. This information safely puts to rest the myth that the IT boom of the 1980s caused this great exodus! Eshwar’s conversational style of writing in his first book, coupled with humourous insight about the people he encountered on the job, results in a light-hearted piece of work, worthy of a lazy weekend.